Pick up passengers from the P2 parking lot south as pictured in the map above. Drop off passengers at the terminal curbside pictured in the map above. Wait for passenger requests in one of the 3 spaces in the rental car/employee parking. Only drivers within the designated staging area (pictured above) are added to the queue. Pick up passengers from the terminal curbside pictured in the map above. Do not wait or circle back at the airport if the passenger is delayed when picking up. Head to the Cell Phone Lot and wait there. Sea-Tac Airport has a strong commitment to being environmentally friendly. As part of this goal, the Port of Seattle will only allow Lyft vehicles with a blended MPG rating of 40 or higher to pick up passengers at Sea-Tac. If your vehicle does not meet this requirement, you will not be added to the FIFO queue and you'll need to leave the staging area immediately. If your car's MPG rating is lower than 40, you can continue dropping off passengers at Sea-Tac as usual — just avoid entering the airport pickup queue so you don't risk deactivation. Remember: Following airport regulations is as important as following traffic laws, and you're responsible for knowing them. Click here to check your MPG rating. Wait in the designated staging area. Only drivers within the Ground Transportation Lot — 3069 S. 160th Street, SeaTac, Washington 98188 — are added to the queue. Follow signs for Arrivals, then keep left for Ground Transportation - Authorized Vehicles Only to pick up passengers inside the parking garage. Look for the TNC/Rideshare signs to locate your passenger in the designated pickup area. You must not pickup at SeaTac airport unless you have your For-Hire permit with you and your TNC vehicle decal displayed. Ground Transportation staff will issue you a citation if you do not have these items. Do not wait or circle back at the airport if the passenger is delayed when picking up. Instead, wait at the designated pickup area inside the parking garage. Important Note: You are only permitted to wait 15 minutes in the parking lot for your passenger. Drop off passengers curbside the terminal entrance on the Departures (upper) level, at your passenger’s carrier of choice. Do not wait at the airport terminal or accept additional ride requests after drop-off. Proceed to the staging area instead. Rematch is a feature enables you to be matched with additional passenger(s) shortly before or after completing a drop-off at SEA airport. This means you can receive a pickup request up to 1 minute after dropping off a passenger without returning to the staging area. When you get to the “STOP” sign (1), proceed through in the far right lane, under “Terminal Direct Parking”. Proceed up the helix to the 3rd floor, and find the App Based Rideshare pickup areas in section G.
In the event that you are not rematched, you must leave airport property. You may go to the designated airport staging area (3069 S. 160th St) if your vehicle qualifies for SEA airport pickups. Your vehicle does not need to meet the MPG requirement in order to be eligible for rematch rides. Obey the 10 mph speed limit. Stop at crosswalks for pedestrians. Do not load or unload in thru lanes. Do not remain in the loading area for more than 10 minutes. 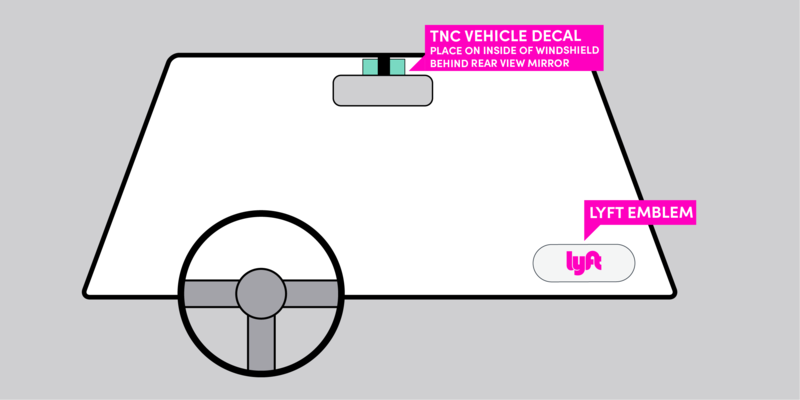 In addition to displaying your Lyft emblem, drivers giving rides at SEA must also display their TNC Decal and carry their For-Hire Permit. When you receive your For-Hire Permit from King County, you'll also be given a TNC Decal. 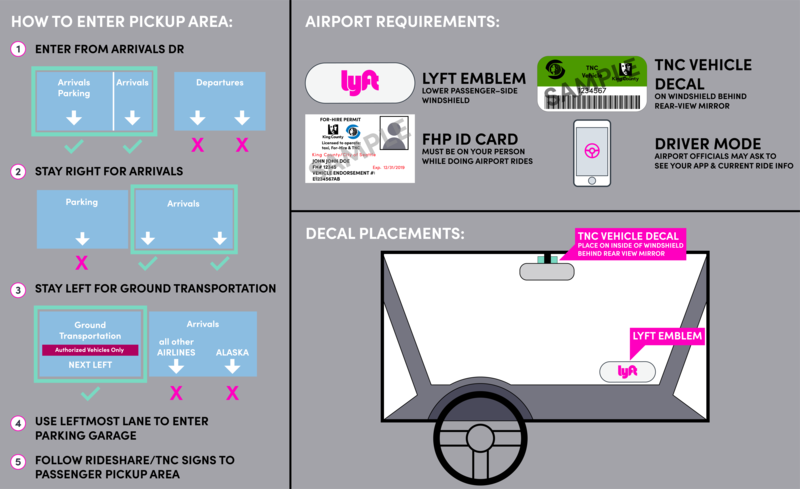 All drivers at SeaTac Airport are required to display their TNC vehicle decal and have their For-Hire Permit on them at all times while in driver mode. Failure to do so may result in citations. Wait for passenger requests in the Staging Area in the Cell Phone Lot pictured above. Only drivers within the designated staging area (TNC Lot pictured above) are added to the queue. Pick up passengers from the designated pickup zones pictured in the map above. Drop off passengers at the drop-off zones pictured in the map above.